In general, goats love food variety. Goat is a natural explorer and loves to wander and search for food. The state of wandering and searching for food is strongly related with its well-being. Goat’s natural food is pasture, trees, grapes, hay, fruits and a small quantity of grains. With the term pasture we define a broad range of plant species: grass, clover, alfalfa (Medicago sativa), chicory, legumes, shrubs, young trees etc. The biodiversity of pasture is directly related to the quality of food consumed (more diverse food – better quality). 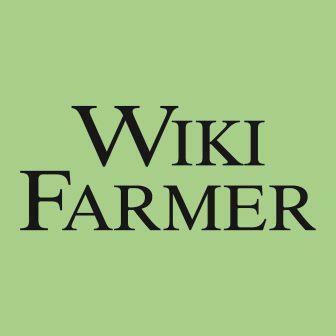 With the term grains we define the seed part of cereals (such as corn) and is a food that the goats used to eat in the wild for centuries, but at very small quantities compared to pasture. Goats have also the ability to stand on their rear feet or climb and eat various tree fruits and vegetation. However, it is not safe to let your goats eat any unidentified plant. Some species of Rhododendron and other ornamental plants (Azalea) and shrubs have been found to be toxic for the goats and may result in life threatening situations after eating even one small leaf. Cabbage, potatoes and tomato leaves have also been reported to be toxic in some cases. In all cases, a future goat owner shall make a research on locally found plants that can be toxic to goats. 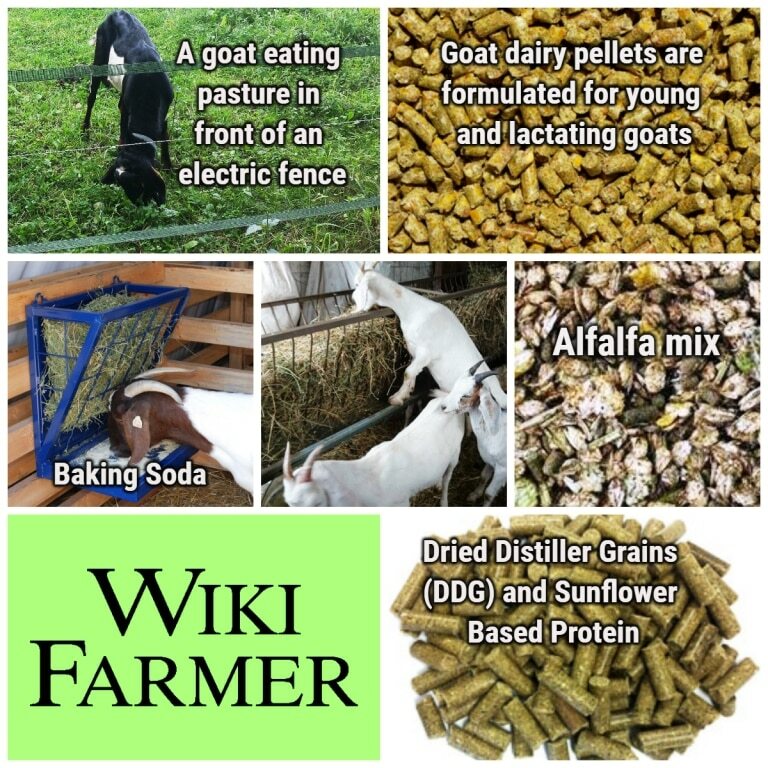 Before the 20th century’s prevalence of commercial goat feeders, old farmers used to base their goats’ diet entirely on pasture, corn, hay and some fruits. However, the most common commercial breeds that have been nowadays selected for meat and/or dairy production respond greatly to commercial feeders. In general, the diet of a dairy goat is different to that of a meat goat. As a rule of thumb, meat goats can rely only on pasture, hay and fruits, whereas dairy goats’ diet is usually supplemented with commercial goat feeders, most of which contain a mix of grains. 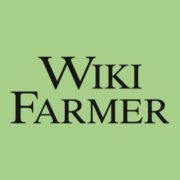 Of course, your field must be able to produce enough diverse pasture most of the year; otherwise you should use commercial feed for all your goats, dairy or not. For example, in many areas where alfalfa and related plant species cannot be grown due to climate, many farmers use commercial alfalfa cubes for goats. The most common commercial goat feed is mixed pellets and cubes made from corn and oats. A typical commercial feeder for young and lactating goats contain grains and trace minerals to support strong milk production and growth. The most common used ingredients are corn, wheat millrun, soybean meal and sun-dried alfalfa. Keep in mind that grains are necessary only for goats of special needs (young, lactating etc.) and should be put in a goat’s diet slowly and at a small quantity. If you exceed a certain limit, the goat will most probably start having various health problems. On average, young goats (from 1 until 14 months old) are usually offered 1-2 coffee cups of mixed grains every day according to their weight (read carefully the labels). However, the goal at this age is to encourage them to learn how to browse and search for their food, with or without their mother. They are also offered hay once a day during summer and twice a day during winter. Minerals and herbal supplements are also offered at a moderate quantity. Mature female goats that are dry and not pregnant are usually offered hay twice a day during winter and once a day during summer, while they are free to browse for pasture most of the day. They are also offered baking soda in feeders (baking soda has been reported to help in the digestion). 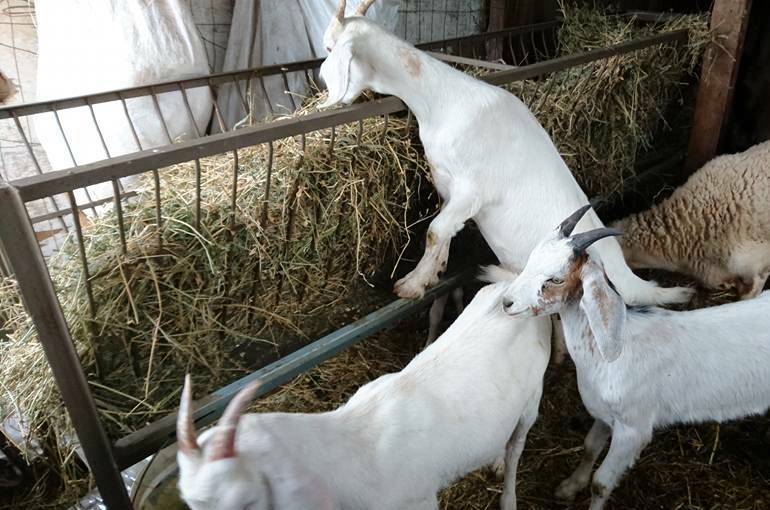 Mature female goats that are pregnant or in the milk side, are offered all the above mentioned plus 2-5 coffee cups of mixed grains per day (depending on the goats weight and milk production – read carefully the labels). Of course, a pregnant or a milking goat does not have the energy to browse all day and search for food, so its diet is usually supplemented with herbal dietary supplements (alfalfa cubes). Mature male goats (bucks) are usually offered all of the above mentioned, apart from grains. Some goat farmers offer a small quantity of grains (1-2 coffee cups) every day, while others feed them just pasture, hay, minerals and some herbal dietary supplements. In all cases, goats must have 24 hour access to water inside their shelter. Waterers must also be placed in 2-3 distant spots of your field. You should change the water at least once a day. You can also put an immovable bowl inside their shelter, where you can put apples, carrots and bananas. Finally, salt blocks (which function as mineral supplements) are added to contemporary goat feed programs. Offering kitchen waste to goats is a controversial issue. Many goat farmers offer a small quantity of fruit and vegetable waste (fruit peels, vegetable skins) or a small slice of bread and their goats seem to love it. However, this kind of food shall be given in small quantities as a treat, rather than as a base of goats diet. An inexperienced farmer shall first consult local experts, local veterinarian and/or agronomist in order to form a rational annual feed program. In many cases, the flora of the region and the weather conditions are important parameters of the final equation. Keep in mind that any changes in the goats’ diet should happen gradually, otherwise the animals will suffer from diarrhea and other disorders. You can also read more on Plants Poisonous to Goats. You can enrich this article by leaving a comment or photo of your goats’ feeders, doses and details on pasture.